TOPAZ HORIZON: Now that's a kitchen that screams Christmas! It's Saturday morning, Vito's finally asleep beside me on the couch. He finally fell asleep to the soothing sound of Nigella Lawson's voice. 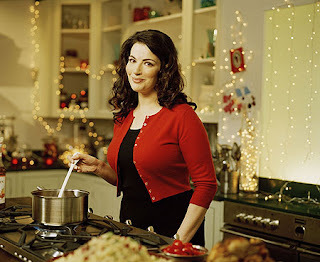 Yep, I'm watching Nigella on the TLC channel and I am drooling over her... kitchen! It's no secret that I love Christmas, I love food and I love Nigella. That video just warms my heart. And I just love how her kitchen looks so magical with all those little points of light. Everything looks like it was sprinkled with fairy dust! Those lights make me so excited for our first Christmas with Vito. I think I'll buy yards and yards of C7 led christmas lights and string them along all over the house. Vito will be enchanted! P.S. Mariel, whatever happened to our cooking show?? ?